Undefeated Welterweight prospect Jamal James scored the nineteenth victory of his career by winning a ten round unanimous decision over Javier Molina on Tuesday night at Club Nokia in Los Angeles, CA. In what was a competitive bout, James used an effective jab to establish distance and was able to use a mix of combination punching off of the jab along with lateral movement to dictate how the fight was fought. Molina was able to have periodic success landing short combinations to the body and head of James throughout. As the fight progressed however, James’ ability to control distance and generally get his punches off first became the difference in the fight. Although Molina was able to have his moments throughout the fight including snapping James’ head back with a flush right hand in the sixth round, he was ineffective in being able to land combinations consistently on James. This can be attributed to not only James’ ability to control distance, but also his ability to slip and evade much of Molina’s offense when Molina was able to get close. Even though there were rounds in this fight that were close due to the combat being fought at a measured pace, James was simply able to outwork Molina and his ability to be the busier and more effective of the two fighters allowed him to win rounds and earn a convincing unanimous decision. Official scores were 99-91, 98-92, and 97-93 all in favor of Jamal James. Unofficially, I scored this fight 98-92 in favor of James. Molina had periods during this fight where he was the more aggressive of the two fighters, but was simply not effective in his aggression. Despite having sporadic success throughout this fight in being able to land offense on James, Molina was unable to change the tempo of the fight and could not discourage James from doing what he wanted to do and that along with James’ effective fight plan is what won the fight for James in this observer’s eyes. Jamal James advances to 19-0, with 9 Knockouts. Javier Molina falls to 17-2, with 8 Knockouts. Also on this card, undefeated Super-Middleweight prospect and knockout artist David Benavidez scored a second round stoppage over Kevin Cobbs. Benavidez was in command from the opening bell as he used a well-balanced attack to the body and head of Cobbs in the first round. In round two Benavidez landed a double left hook that staggered Cobbs along the ropes. Cobbs briefly held on, but did not have an answer for Benavidez’ follow-up barrage, which caused Referee Raul Caiz Jr. to step in and stop the fight. Official time of the stoppage was 1:08 of round two. David Benavidez advances to 12-0, with 11 Knockouts. Kevin Cobbs falls to 10-2, with 4 Knockouts. In the Middleweight division rising prospect Malcolm McCallister scored a third round stoppage of Tyrone Selders. McCallister scored a knockdown of Selders in the first round when a right/left combination stunned Selders causing one of his gloves to touch the canvas giving McCallister credit for a knockdown. Despite suffering a cut over right eye later in the round as a result of an accidental clash of heads, McCallister systematically broke Selders down and the one-sided bout was stopped in round three. Official time of the stoppage was 2:39 of round three. Malcolm McCallister advances to 7-0, with 6 Knockouts. Tyrone Selders falls to 9-7-1, with 6 Knockouts. Middleweight Caleb Plant (12-0, 9 Knockouts) TKO6 over Adatar Rodriguez (11-5-2, with 7 Knockouts). Official time: 2:37 of round six. Featherweight Thomas Velasquez (4-0, 3 with 3 Knockouts) TKO over James De Herrera (3-3, with 2 Knockouts). Official time: 2:08 of round four. Featherweight Aaron Alameda (12-0, with 8 Knockouts) KO6 over Andre Wilson (14-11-1, with 12 Knockouts). Official time: 1:38 of round six. Welterweight Sanjarbek Rankmanov (4-0 with 3 Knockouts) TKO4 over Jose Castro (5-7, with 3 Knockouts). Official time: 1:27 of round four. Light-Heavyweight Ronald Mixon (6-0, with 5 Knockouts) TKO2 over Christian Solorzano (3-7, with 2 Knockouts). Official time: 1:49 of round two. Heavyweight Con Sheehan (Pro Debut/1-0, with 0 Knockouts) UD4 over Jonathan Rice (2-1-1, with 2 Knockouts). Official scores: 40-36 (on two scorecards), and 39-37 in favor of Sheehan. On a card that featured a good mix of rising prospects to fighters who are approaching contender status fighters such as Jamal James, David Benavidez, and Malcolm McCallister should all be regarded as fighters to watch in 2016. 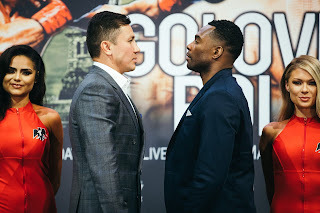 How quickly these fighters move up the ladder of contention in their respective weight classes remains to be seen, but all three succeeded in producing impressive victories on this card. Whomever either of them face in their next bouts, if they continue to progress it may not be hard to envision either of the three facing a fighter who is considered a contender before the end of the year.